Making homemade cranberry sauce is so easy, I don't know why we all don't do it instead of buying that gawd-awful high fructose corn syrup laden crap in a can. Truly. It takes all of 15 minutes to make a decent and 3 ingredient cranberry sauce, and maybe 5 minutes longer to make a "gourmet" version! For my Autumn Brunch class this past Sunday at The American Table - I made whole wheat pumpkin pancakes and the Cranberry Maple Syrup that I created for that Talk Philly Live Thanksgiving Left-over television segment I filmed last year. The recipe for the syrup is online, but I never put it on the blog. I have my cranberry apple ginger compote here, but that's about it. Time to remedy both over-sights! 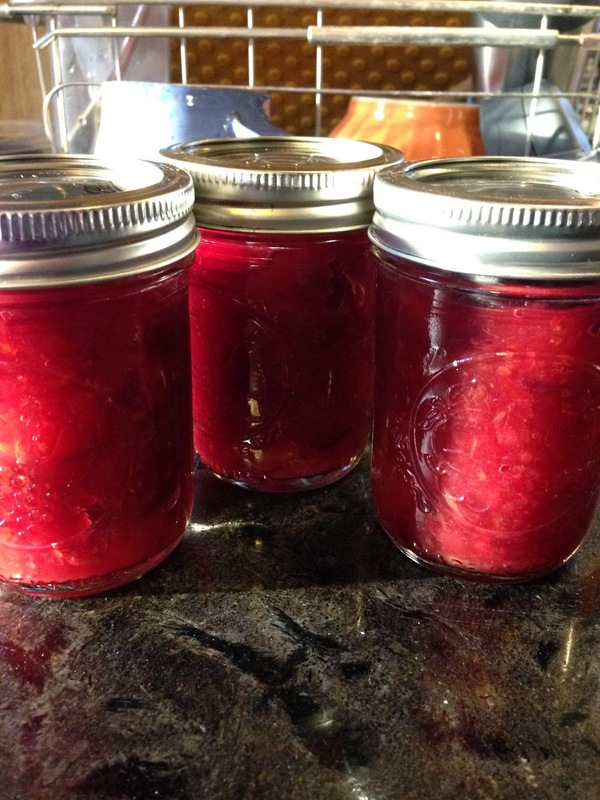 By the way, homemade cranberry sauce can be canned very easily. Cook it, heat it and get your jars ready. Then ladle hot sauce into hot jars and process in a hot water bath for 20 minutes per pint jar. Consult the Bell Canning Website for more details! Wash and pick over the fresh cranberries, discard any that are bad. Put the cranberries into a sauce pot and set aside. Zest the orange. Then remove the skin and pith from the orange. Carefully, with a paring knife, segment the orange, removing the sections from the membrane. Work over a small bowl to catch the juices. 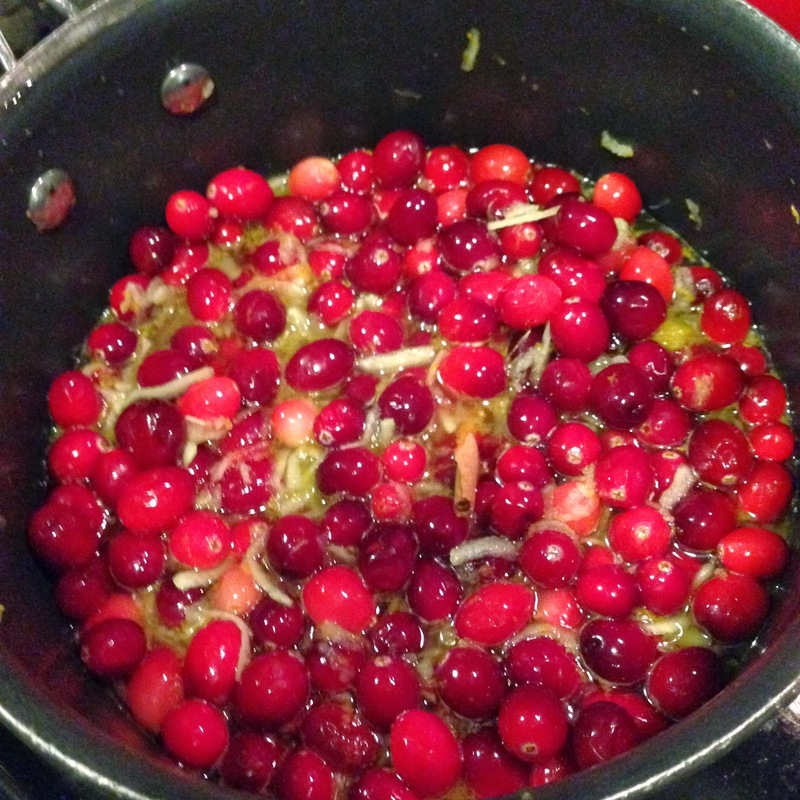 Put the zest, juices and orange segments into the sauce pot with the cranberries. Peel, core and coarsely grate an apple. Add the grated apple to the cranberries. Add in the cinnamon stick, the sugar and the water to the pot. Bring the mixture to a boil, stir to combine and help the sugar to dissolve. Reduce heat and simmer until all the cranberries "pop" and cook down, about 15 minutes. 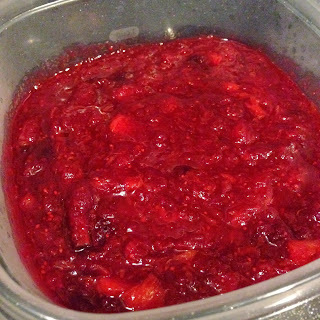 As the cranberries break down, they will release their pectin, which will thicken the sauce as it cools. If you want a smoother sauce, you can a) use a handheld potato masher and smash the fruit down, or puree it in a blender or food processor. Remove the cinnamon stick! If keeping chunky, remover the cinnamon stick and cool at room temperature for about 1/2 an hour then cool in the refrigerator for several hours or longer. Will keep for up to 1 week, covered. Combine all the ingredients together into a heat-safe or microwave-safe bowl. Whisk together until the ingredients are smooth or thoroughly combined. Heat mixture for 2 minutes in a microwave or in a sauce pot just until just before the mixture comes to a boil. Whisk again to combine. Serve hot over pancakes or waffles. Makes 1 and 1/4 cup of sauce. Will hold for 1 week in a tightly covered container in the refrigerator. Heat before re-serving and to emulsify the butter. Serve over pancakes, waffles, pound cake or in oatmeal!